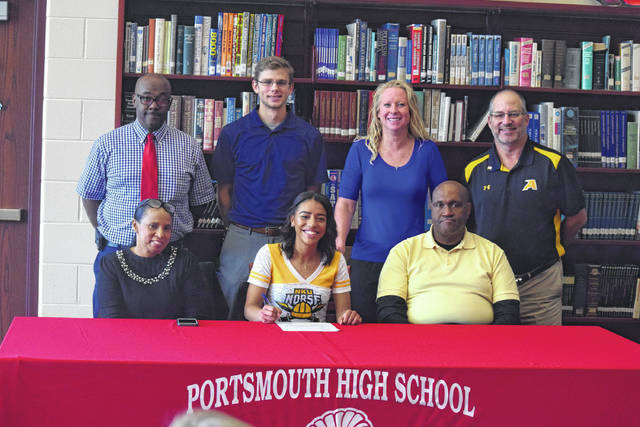 Portsmouth’s Lynsey Shipley, who is arguably the Trojans’ most decorated track athlete in school history, signed with Northern Kentucky on Friday evening. Front row from left to right: Lynn Shipley (Lynsey’s Mom), Shipley, Juan Shipley (Lynsey’s Dad). Back row from left to right: Arthur Lard, Brad Liston, Amy Hughes, Joe Albrecht. To watch a person fulfill a dream that he or she has had since an early age is always special to see. However, if one witnessed the emotions that Portsmouth’s Lynsey Shipley had during, and immediately following, the standout cross country and track athlete’s signing on Friday afternoon, it would’ve been hard for said person to keep their eyes from welling up, as well. Shipley, the defending state champion in the 400 meter dash at the OHSAA Division III realm (56.28) and a standout student who holds marks that are even more blistering than her track times, made her signing with Northern Kentucky University official alongside her parents and coaches, and in front of a large crowd that included her fellow teammates, friends, and school faculty members inside the halls of Portsmouth High School on Friday evening. For Shipley, the signing was, without question, overwhelming. However, it’s certainly thrilling, as well — especially since the scholarship is a full ride that gives the senior standout an opportunity to earn a free education that is well-deserved due to the efforts of Portsmouth’s latest example of excellence. However, in Arthur Lard’s eyes, it’s hard to find anybody who is more deserving of a full-ride scholarship than Shipley. Throughout the course of her high school career, Shipley has been nothing short of outstanding in all facets for Portsmouth en route to breaking down barriers never before seen inside the Lady Trojans’ track program. The senior, who has qualified for the OHSAA Division III Track and Field State Championships in each of the past two seasons while taking home eight medals at the state realm, has won the Ohio Valley Conference Championship Meet’s 100, 200, and 400 meter events in each of the first three seasons of her high school career while also taking home the OVC’s long jump crown in each of the last two years. Her magic, however, has really been showcased at the state level, where Shipley has simply kicked it up a notch with an excellent blend of confidence, preparation, and skill. Behind the tutelage of Lard, Portsmouth’s stronghold in the track and field coaching realm, Shipley garnered an OHSAA Division III runner-up finish in the 400 meter dash with a time of 57.02, and added fifth and sixth place finishes in the 100 meter dash (12.59) and the long jump (16 feet, 10.5 inches), respectively, as a junior. But with her goals within reach, Shipley kept working — and became a champion as a result. In 2017, Shipley finished in the top-six in all four of her main cards — the 100, 200, and 400 meters as well as the long jump — in the Division III, Region 11 Championships and added blistering marks of 57.45 in the 400 meter dash, along with a 16-foot, eight-inch long jump, to finish first and second in both events en route to entering last June’s OHSAA Division III Championships as one of the favorites to cash in on a lifelong dream. And as expected from a person like Shipley — and a person whose last name starts with ‘Ship’ — that’s exactly what one of Portsmouth’s very best did. After watching Archbold’s Dakota Stamm ran a 57.33 to her 57.50 in the preliminarily round of the 400 meters, Shipley stepped up her game in a tremendous fashion by running a 56.28 — a time that Stamm couldn’t equal even after running a splendid 56.74 — en route to taking home the OHSAA Division III State Championship in the 400 meters. Shipley then made another big jump by notching a massive jump of 17 feet, 10.5 inches to claim a third-place finish in the long jump and close out a truly splendid day where the student-athlete garnered 16 points on her own to lead Portsmouth to a tie for 10th-place at the state level — despite being the only competitor to qualify on the Lady Trojans’ squad. But all of her success, Shipley says, wouldn’t be possible without the welcoming environment that has been set up around her. However, her academic efforts prove that Shipley has created much of that environment on her own due to her own hard work. This is evident by a truly outstanding 4.51 grade-point-average that has come due to Shipley’s work in the various Advanced Placement and Honors courses that are offered at Portsmouth, which has, in turn, allowed Shipley to obtain OVC Academic Athlete and Academic All-Ohio awards in addition to a National Honor Society membership. And if that wasn’t enough to satisfy one’s fancy, the senior stalwart is also a part of the Key Club and Quiz Bowl teams at Portsmouth High School in addition to her duties as a high school cheerleader, which were all key qualities in an official proclamation in honor of Shipley by the City of Portsmouth on July 24. However, Shipley, again, credits her support system as arguably the main reason for her success. With such a strong support system already in place for a high school athlete, it can be tough for an athlete to find that same support, especially when he or she is competing for valuable time with student-athletes from all across the country. But with Northern Kentucky, Shipley felt like that support — both from a student and an athlete perspective — was there the entire time. So when Fruse made the official offer that made Shipley’s lifelong dream a reality, it came as a too-good-to-be-true moment to the young running phenom. However, Shipley knows that there is business to attend to before she can officially put an end to her high school days, and that includes not only defending her Division III Championship in the 400 meter dash, but obtaining better marks — and at least top-three finishes — in the 100 meters, 200 meters, and the long jump at the state meet.